Do you have any relatives who belonged to the Stevenage National Fire Service? The National Fire Service was formed in 1941 by amalgamating the wartime national Auxiliary Fire Service and the local authority fire brigades . It existed until 1948. The men (and women) all served part time, and performed a valuable and often dangerous service in the war. 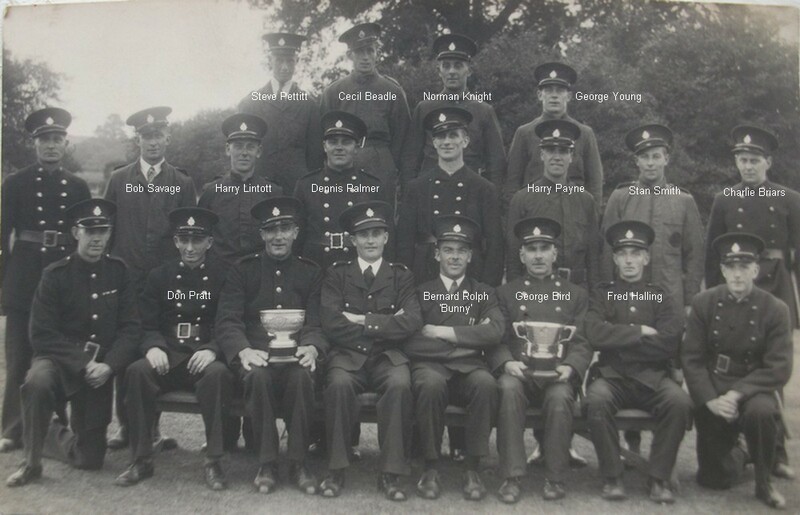 The photo on this page shows the Stevenage firemen who were in service probably around 1944 or 1945. Some of the names have been added. Can you add some more? Maybe you know something about some of the men in the picture. Do you know what the trophy was for? Please add a comment if you can help. This page was added on 05/06/2013. The above photo now shows the names of all the recognised firemen so far. Thanks for the information. The back row is S.Pettit, C.Beadle, W.Knight and G.Young. My grandad is Cecil Beadle and G.Young has also been confirmed by his son. Call out the engine, is a 65 page publication by the Stevenage Society. Covers Fires and firefighting in Stevenage from 1700 – 1945. Ref Picture on P 132. I think you will find that naming is “all most” correct. Left to Right – back row Halling, Palmer, Pratt, Rolph. Front row Lintott, Hunt. Other than Firemen Pettitt and Beadle, the other names were taken from the book ‘Stevenage in Old Photographs’ by Maggie Appleton and definitely has Hunt / Rolph as per photo? Dear Mr Briars please could you confirm if “Call out the Engine” is a chapter in the book Stevenage at War’ by John Amess?? Also received some further information today that Fireman Lintott (in picture) is actually Fireman Don Pratt, therefore the accuracy of the previous mentioned book is now certainly in doubt in terms of the correct order of names given on the picture appearing on P.132. I think the 2 People Hunt / Rolph have been mixed. Mr B F Rolph was in 1943 NFS Company leader. One of the trophys is probably 2nd Place in “four man Light Trailer pump drill” There is a lot of information on the Stevenage fire service, in ” Call out the Engine” by John Amess.